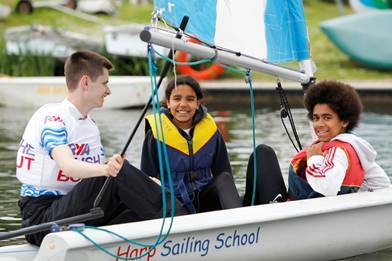 More than 370 sailing venues across the UK will be giving people of all ages and abilities the opportunity to get out on the water and discover a new sport this May with RYA Push the Boat Out. The nationwide event returns for nine days this year from 13-21 May and will see thousands of people having a go at sailing and windsurfing at free and low cost taster sessions across the UK. “During the two weekends and five weekdays, more sailing clubs and centres than ever before will be showcasing what the sport has to offer, from the freedom of being on the water to the social buzz, the thrill of racing and the fact that there really is something for everyone” explains Alistair Dickson, RYA Director of Sport Development. “Sailing is such an accessible sport and many people aren’t aware of the opportunities available close to them or how affordable the sport can be, even for the whole family. Push the Boat Out is all about making that connection and we’re delighted to have so many venues taking part this year”. Over 90,000 people have experienced sailing at Push the Boat Out events since 2013 with hundreds becoming members of sailing clubs and signing up for courses. Saskia Clark, Rio 2016 Gold medallist said: “I got into sailing through my local sailing club so it’s fantastic to see so many people given the opportunity to discover what the sport’s all about right on their doorstep. If you want to inspire your non-sailing friends and family to giving sailing and windsurfing a go, make sure you put Push the Boat Out in the diary”.